Have you ever had a recipe passed down so many times that no one knows where it came from? Welcome to Arkansas, and the mystery of the Arkansas green beans recipe! Fortunately, your dog won’t ask you where the recipe came from, because they will love it anyway! 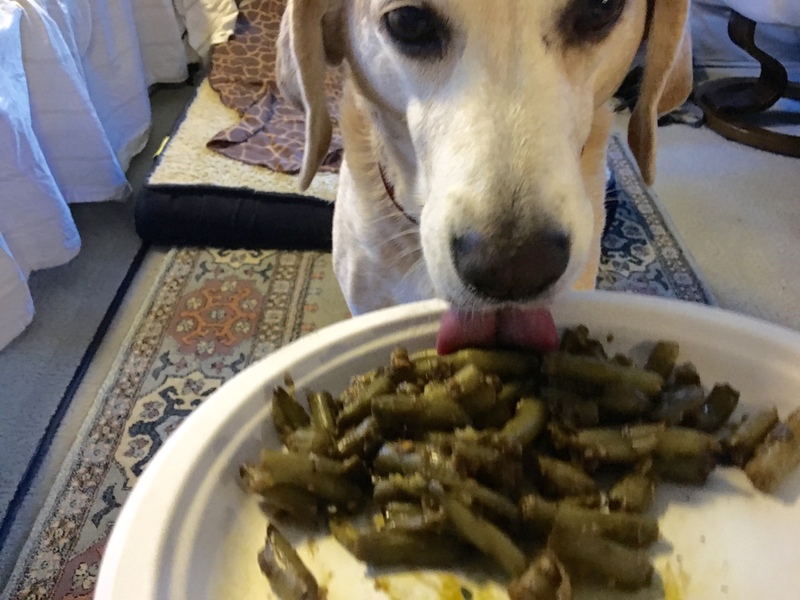 This is a simple, tasty recipe but it has been adapted for your dog. In the people version, soy sauce is used. That amount of salt would not be acceptable to a dog, so we have altered it a bit! Spray non-stick cooking spray on pan and preheat oven to 350 degrees. Combine all ingredients and spread in the pan. Bake for 30 minutes. Let cool and serve! This can be refrigerated for up to 4 days in an airtight container or frozen for up to 3 months. Disclaimer: This is meant as a treat and not as a meal replacement. Portion out at 1/2 cup portions with their meal or as a side dish. Never serve hot food to your dog. Always consult a vet before making any changes to your dog’s diet.